SCA cannot survive winters north of southern Texas and must re-colonize Kentucky each year. SCA can be identified by their black tail pipes and antenna. On grain, forage, and sweet sorghum, SCA has the ability to be very destructive, potentially causing 100% crop loss. Growers should begin scouting their sorghum weekly by searching the undersides of 40 leaves between knee and chest height in a field. If SCA is found, scouting should be done twice a week as SCA can reproduce rapidly. If over 25% of those leaves have 50 or more aphids, it is recommended that management action be taken. Preventive insecticide sprays are not recommended as SCA infestations do not always reach damaging levels. Be a certified applicator (private or commercial). Report the acreage and volume sprayed to Ric Bessin (rbessin@uky.edu) or the Kentucky Department of Agriculture (web@ky.gov). 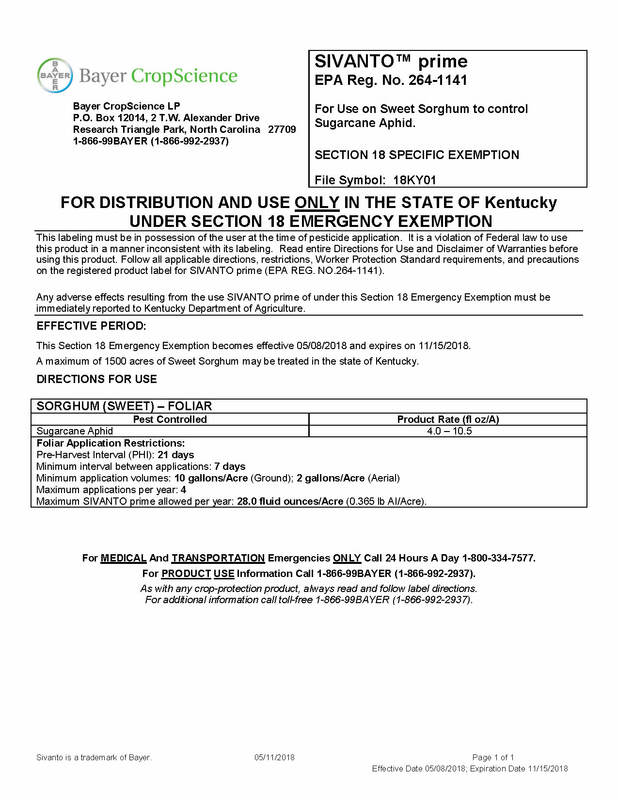 This reporting is to ensure that Kentucky will be eligible to obtain the emergency exemption from the EPA in the future. Sivanto Prime is already labeled for use on grain and forage sorghum and can be sprayed in accordance with the label. Producers may use Sivanto Prime on grain, forage, and sweet sorghum up to four times a year at a lower rate of 4 fluid ounces per acre and an upper limit of 10.5 fluid ounces per acre. Growers cannot apply more than 28 fluid ounces per acre per year and must have at least 7 days between applications and 21 days from application to harvest.